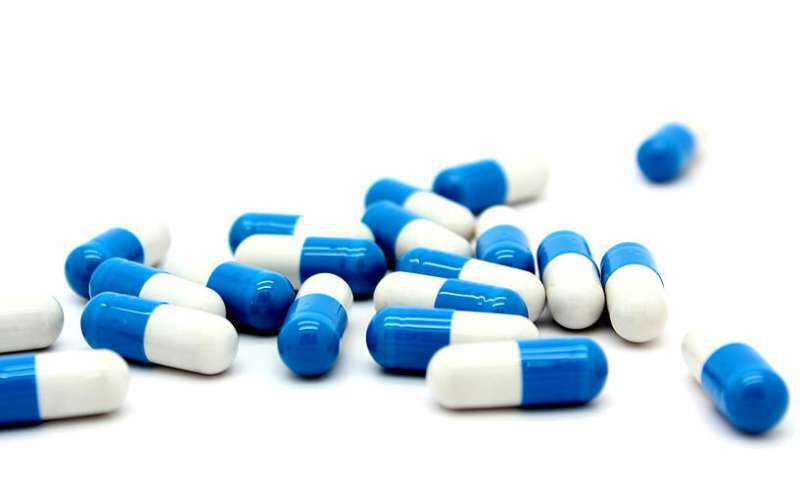 The development and improvement of pharmaceuticals plays the central role in the ongoing battle against human disease. Organic synthesis is the field that enables these developments as it offers the toolbox to diversify chemical structures. The group of Nuno Maulide, recently named the Scientist of the Year 2018 in Austria, in collaboration with the group of Harald Sitte, has now reported a facile method for the replacement of hydrogen with fluorine in important drug molecules. 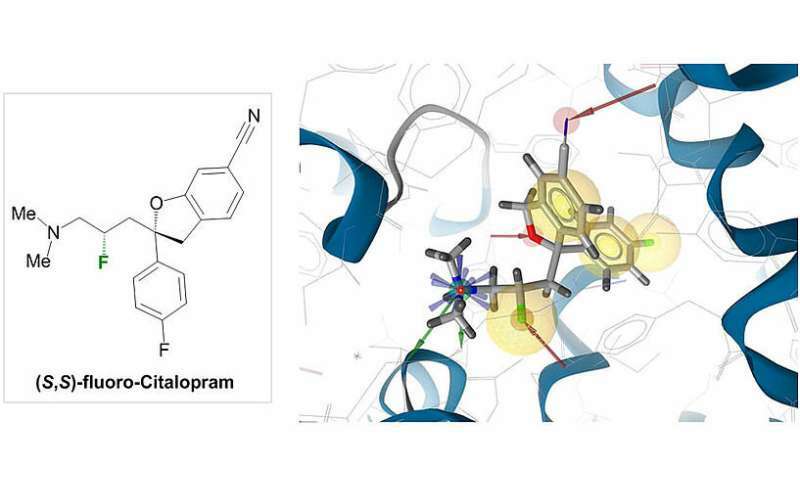 This new discovery enables the fine-tuning of existing (and potential new) pharmaceuticals to endow them with improved pharmacological properties. 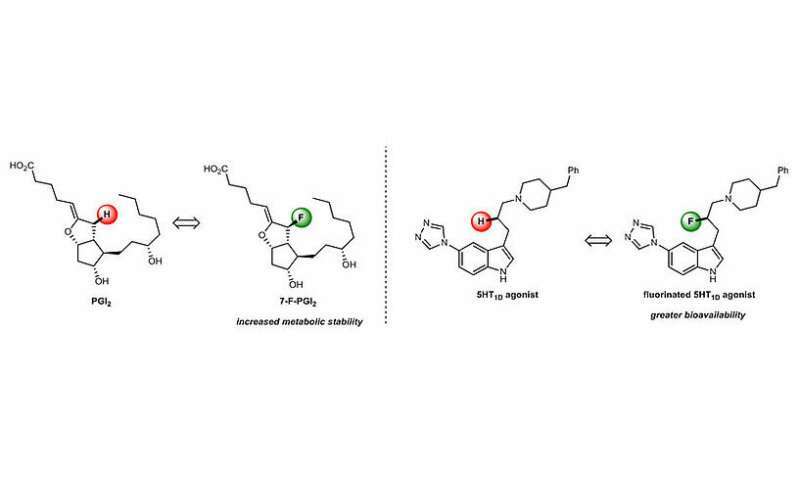 The results have been recently published in the renowned journal Nature Chemistry. However, just as nutrients are metabolised by the body, pharmaceuticals that enter the body (made up of the same essential constituents, carbon, hydrogen, …) are also degraded by the same enzymes that metabolise and eliminate our food constituents. "This type of clean-up machinery is essential for our body in order to protect itself; molecules that are undesired and could have negative effects must be eliminated swiftly. Unfortunately, such machinery is often indiscriminate and pharmaceuticals will also be metabolised as soon as they enter in contact with the body", explains Christopher Teskey, PostDoc in the Maulide group and joint first author of the study. This can alter the structure of pharmaceuticals and therefore also remove their beneficial properties. "Large parts of this degradation occur precisely at the junction of carbon and hydrogen atoms (C–H bonds), that can be broken or altered to form new compounds that can be more easily cleared from the body by excretion. C–H bonds are inherently rather weak bonds, meaning that oxidation can take place easily", explains Pauline Adler, former PostDoc in the Maulide group and the study's other joint first author. "It ultimately is a race to escape cleaning up! The longer a beneficial pharmaceutical can escape this cat-and-mouse chase with the metabolism enzymes, the longer its beneficial effect can be felt in the body", jokes Maulide. It is therefore obvious that, if the structural weak points of drug molecules could be eliminated or mitigated, their metabolic stability could be significantly increased. Chemists have found some years ago that the strategic replacement of especially weak C–H bonds with much stronger C–F bonds can be a highly rewarding approach in this direction. While hydrogen and fluorine are distinctly different in some respects, their sizes are comparable, and the replacement of H with F can therefore often be assumed to have only minimal effect on the structure of the key (pharmaceutical). 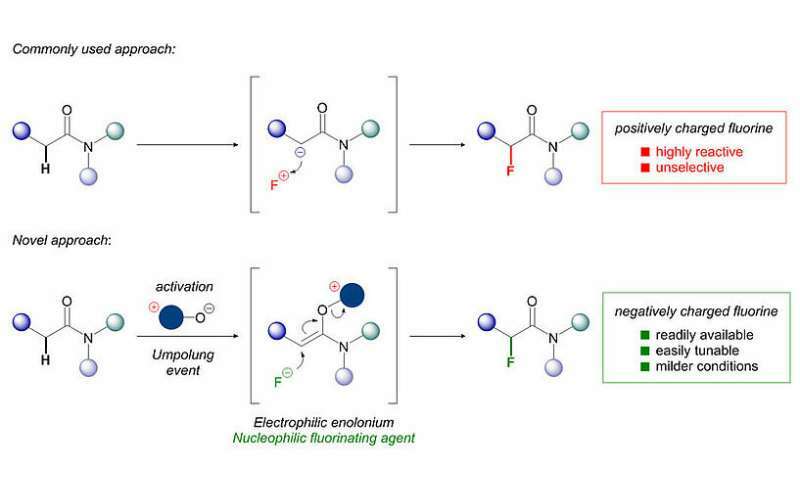 "Even more so, because of these differed electronic properties, a strategically placed fluorine atom can potentially establish additional interactions with its target (lock), thereby enhancing the desired activity", explains Maulide. "Moreover, introduction of fluorine into a drug molecule can alter its properties in such a way that it can be more easily absorbed by the body (increased bioavailablility), once again increasing the amount of drug that can find and interact with its receptor. It really can be a 2-in-1 situation! ", posits Daniel Kaiser, former Ph.D. student of the Maulide group and co-author of the study (Figure 1). The research group of Prof. Nuno Maulide (Institute of Organic Chemistry, University of Vienna) has now discovered a facile and selective method for the introduction of fluorine atoms into organic molecules using the widely available fluoride anion (F–). "Most chemists have looked to introduce fluorine by using negatively polarised organic molecules that can react with a F+ reagent. We simply did the opposite: switch polarity of the organic molecule so that we can use the same fluoride you have in toothpaste! ", enthuses Maulide. Importantly, this approach employs cheap starting materials, is operationally simple and delivers high yields of the products in short amounts of time.